The Arunachal Pradesh Abotani Community Confederation (APACC) has questioned Arunachal Pradesh Deputy Chief Minister, Chowna Mein, on what basis had he assured granting Permanent Resident Certificates (PRCs) to the Non-Arunachal Pradesh Scheduled Tribe (APST) communities residing at Lekang Circle of Namsai district. Mein on Thursday had reportedly in an interview to local media houses of Lekang and those of Assam had announced to grant PRCs to non-Arunahcalees, who have permanently been residing in Lekang Circle as a New Year gift. Addressing a news conference at the Press Club here on Saturday, APACC chairman, Taba Taku, while questioning the intent of the Deputy Chief Minister said that a sub-committee under the chairmanship of Environment and Forest Minister Nabam Rebia has already been constituted to look into the matter and the announcement made by Mein was just ‘questionable’. “If the Non-APST population is issued PRCs, then there will be no need of Inner Line Permits (ILP) and when ILPs will not be required then there is no meaning to our State being termed as a protected one,” he said. Arunachal Pradesh is protected by the Bengal Eastern Frontier Regulation (BEFR) Act of 1873 which besides prohibiting all citizens of India from entering the State without an ILP also does not give licence to foreigners to buy land, settle and do business. One should also be aware of the meaning of ‘Protected State’ and only after the discussions are complete and proper policies are framed, it makes sense to make an announcement, Taku said further raising apprehension whether the statement was only to gain political mileage as the 2019 Assembly polls are approaching. Taku, however, clarified that they are not against the granting of PRCs, as many of the communities deserved to have it. Though various community based organizations and unions of Namsai district have decided not the oppose the granting of PRCs to the non-Arunachalees of Lekang, the Deputy Chief Minister should at least seek suggestions from them before making such a big announcement, he said. The All Papum Pare District Students’ Union (APPDSU) has also condemned the statement made by deputy chief minister Mein and termed it an ‘irresponsible’ one. APPDSU is a member of the joint high power committee (JHPC) constituted by the Government to look into the PRC issue. 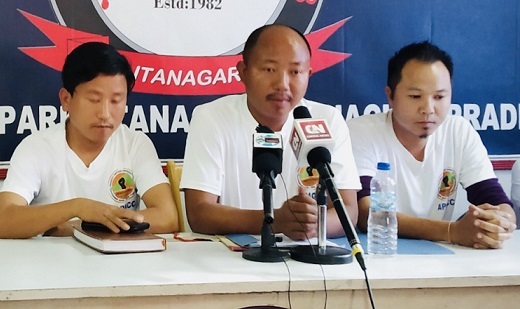 “The non-APST communities settled in Lekang constituency of Namsai district should know that none of their elected representatives have attended any meeting of the JHPC till date to voice out their rights. Moreover, as per the court’s directives the chairman of the JHPC cannot take any decision on the matter alone without involving all the stakeholders and prior approval from all the members of the said committee, the Union said in its statement this evening. The Deputy CM is well aware of the fact that matter is not confined to his constituency and district alone. Therefore, such loose statement made by a man who is holding a high position in the State government is very condemnable. Such statements can create chaos and confusion in the State, APPDSU added. The Union has further demanded Mein to withdraw his statement at the earliest and cautioned of a mass democratic movement against the government if he fails to do so.